How to paint metal armor for concept art and illustration painting technique. In this tutorial, you will learn how to paint metal from video instruction. You can scroll down further to see step by step tutorial. Indeed painting metal is not as hard as you might think as long as you understand how light work on material’s surface. The key is to understand lighting and how reflective the surface of your subject that you are trying to paint is. Metal has a very unique property when interact with light, but different kind of metal also have variation of reflective quality reaction to the light source. But for the most part, metal is highly reflective to the light, it is usually create a really high contrast on the material surface. In this video, you will see how I paint a metal armor. It should be really easy to follow and understand. 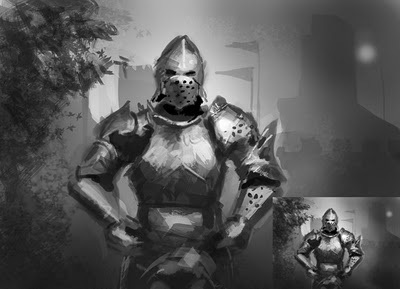 You can use the same technique you learn here and apply them to all your illustration, concept art or any painting you want to do in the up coming future. Below are step by step images easy to follow along with the video tutorial. 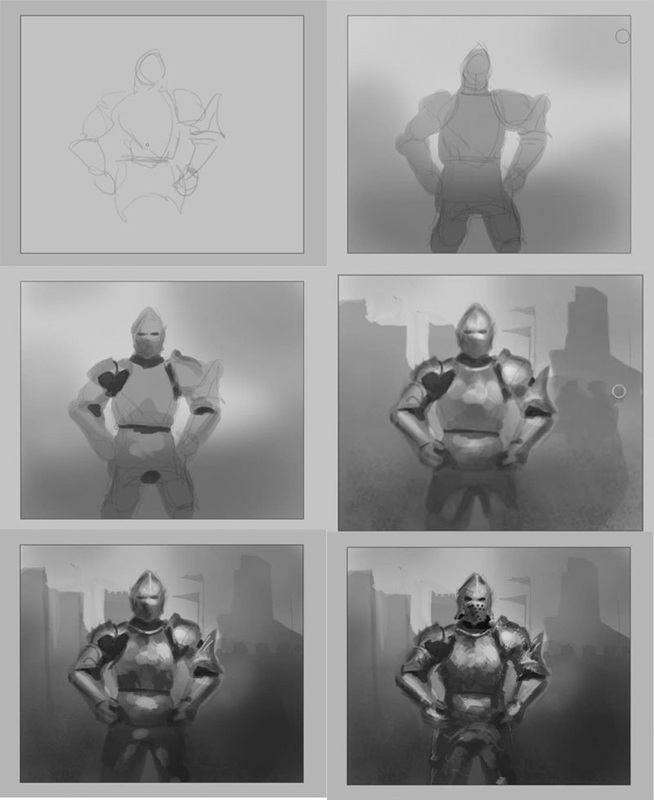 Step one, I just draw out a rough shape of a knight armor. Step two, I paint in a dark gray as a base color since we are going to make it steel or metal looking. Metal base color should be gray or blueish gray, it could also be green. Step three, I then paint in some basic shadow over the figure. Step four, now I start to apply really high contrast in light and shadow on its torso, head, and shoulder. If you notice the range of value on those parts are very different in lightness and darkness. Step five, now I add even darker shadow on some spot on each part of the armor. It now start to look hard and highly reflective resemble metal or steel. Step six, I add some grime texture on to some part very subtle, not to over do it. Keep the value consistence through out the subject. Watch the video tutorial for more in depth detail instruction on how to paint metal armor.